San Diego Magazine annually list Mirowski as one of San Diego’s Top Business Lawyers. San Diego Business Journal has granted Mirowski one of the Top Corporate Counsel Awards for 2015 and 2016. Paul Jospeh Mirowski grew up in Michigan where he earned his Bachelor of Science at Michigan State University. Later he moved to San Francisco to attend law school at the University of San Francisco School of Law. After passing the California bar on his first try, in 1983 Paul formed Mirowski & Associates in San Diego and naturally specialized in representing the Creative Community. One should never leave one’s passions behind. Paul’s passions are wine and music. In addition to the practice of law, Paul Mirowski is a winemaker and musician. Paul has written and lectured on various topics including many Entertainment and Intellectual Property issues, served as a Commissioner pro-tem (Small Claims Judge) in San Diego Courts and has been an adjunct professor of law at Thomas Jefferson Law School, UCSD and Grossmont College where he has taught such classes as “Entertainment Law and Practice” and “Computer & Hi-Tech Law.” Paul’s legal career includes a “scam” busting case against local “talent agents” which was widely covered by the San Diego news media and successfully advocating for his client in a New York Federal Appellate case concerning Trade Secrets [See Julie Research Lab. Inc. v. Select Photographic Eng. Inc. et. al. (1993) 998 F.2D 65]. 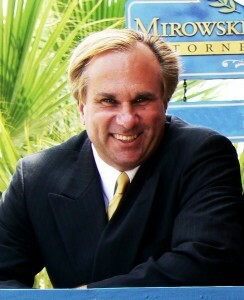 Mirowski has also been Chairman or Co-Chair of San Diego Entertainment & Sports Lawyer’s Association and presently hangs his shingle as Mirowski & Associates in La Mesa. Even with his law practice, Paul continued to be involved in the music scene. In his early years, Paul played keyboards in such notable bands as Primal Grunt. After finishing law school and moving to San Diego, Paul formed the band “Species” and later released an album of his original work entitled “Of Questionable Origins.” This album can be purchased on-line including from ITunes Species ITunes. Paul continued to be involved in artistic endeavors including playing keyboards and rhythm guitar in San Diego bands including “The Cubes” (an 80’s cover band), “Shady Grey” (a Classic Rock cover band) and “Rock Justice” – the Winner of the 2007 “Jam for Justice” Battle of the Bands and again, Winner of the 2010 Battle of the Bands held respectively at 4th & B and Canes in Mission Beach by the YNLD section of the San Diego Bar Association. PLEASE NOTE: THE FOLLOWING CONSTITUTES THE TERMS AND CONDITIONS FOR THE USE AND VIEWING OF THIS WEBSITE. BY ACCESSING THIS WEB SITE, YOU ARE AGREEING TO THE TERMS HEREIN. (Pay attention – This is the “legal stuff”). NOTHING CONTAINED HEREIN CREATES AN ATTORNEY-CLIENT RELATIONSHIP BETWEEN MIROWSKI & ASSOCIATES AND THE VIEWER. THE INFORMATION WHICH IS CONTAINED HEREIN, OR WHICH MAY BE DERIVED, FROM THE CONTENT OF THIS WEB SITE, IS SIMPLY OFFERED FOR GENERAL INTEREST AND DISCUSSION. SAID MATERIAL IS NOT TO BE INTERPRETED AS LEGAL ADVICE. ACCORDINGLY,MIROWSKI & ASSOCIATES SHALL NOT ASSUME ANY LIABILITY FOR RELIANCE, BY ANYONE, ON ANY OF THE INFORMATION CONTAINED HEREIN. MIROWSKI & ASSOCIATES DISCLAIMS ANY WARRANTY, EXPRESS OR IMPLIED AND IN NO EVENT WILL MIROWSKI & ASSOCIATES BE LIABLE FOR ANY CLAIMS OR DAMAGES, INCLUDING BUT NOT LIMITED TO ANY LOST PROFITS NOR ANY INCIDENTAL OR CONSEQUENTIAL DAMAGES. ANY LINKS PROVIDED IN THIS WEB SITE ARE PROVIDED SOLELY FOR THE CONVENIENCE OF THE VIEWER. THE VIEWER IS NOT TO ASSUME ANY ENDORSEMENT, SPONSORSHIP, RECOMMENDATION OR RELATIONSHIP BETWEEN MIROWSKI & ASSOCIATES AND THE CONTENT, INDIVIDUALS OR ENTITIES FOUND AT SAID LINKED SITES. MIROWSKI & ASSOCIATES ASSUMES NO RESPONSIBILITY FOR THE CONTENT, ADVICE, LEGALITY OR DECENCY OF MATERIALS CONTAINED IN LINKED SITES. ALL LINKS ARE ACCESSED AT THE VIEWER’S OWN RISK. THERE CAN BE NO GUARANTEES OF CONFIDENTIALITY WITH REGARD TO COMMUNICATIONS TENDERED OVER THE INTERNET. MIROWSKI & ASSOCIATES ASSUMES NO LIABILITY OR DUTY TO PROTECT COMMUNICATIONS DIRECTED AT OUR OFFICES BY EMAIL OR OTHER UNSECURED COMMUNICATIONS. CLIENTS OF MIROWSKI & ASSOCIATES MAY CONTACT US FOR IMPLEMENTATION OF SECURITY PRECAUTIONS. ALSO, PLEASE BE WARNED THAT UNSECURED COMMUNICATIONS MAY LOSE THEIR ABILITY TO BE PROTECTED BY THE ATTORNEY-CLIENT PRIVILEGE. THE USE OF “MIROWSKI & ASSOCIATES” OR “WE” OR “US” HEREIN SHALL BE INTERPRETED AS TO INCLUDE ALL ATTORNEYS, EMPLOYEES AND AGENTS OF MIROWSKI & ASSOCIATES IN ADDITION TO ANY OF THOSE PERSONS OR ENTITIES WHO DIRECTLY OR INDIRECTLY HAVE PLAYED A PART IN THE DESIGN, IMPLEMENTATION OR DISPLAY OF THIS WEB SITE. ANY COMMENTS, COMPLAINTS, REVIEWS OR NOTATIONS REGARDING THIS WEB SITE SHOULD BE DIRECTED TO PMIROWSKI@MIRLAW.COM. BY VIEWING THE CONTENTS OF THIS WEBSITE, THE VIEWER, AND ALL RELATED PARTIES AGREE THAT THE ONLY PROPER VENUE AND JURSIDICTION FOR ANY CLAIM, ACTIONS OR TRIBUNAL OF ANY KIND REGARDING THIS WEBSITE AND THE CONTENT THEREIN MUST BE INSTITUTED AND CONDUCTED IN THE CENTRAL DISTRICT OF SAN DIEGO CALIFORNIA.